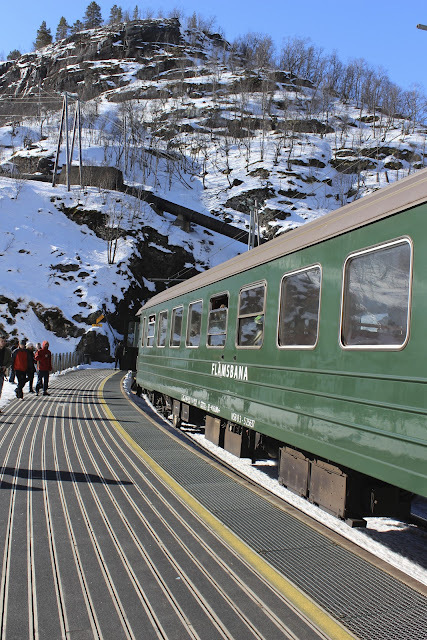 One of Norway's most popular trips is the Norway in a Nutshell tour and while Joe and I had never done it ourselves, when we found out that Jeanie was coming, we thought it would be the perfect way to spend Easter long weekend. Jeanie would be able to see more of Norway outside of Stavanger and Joe and I would explore a region we had yet to visit. Norway in a Nutshell is basically a fully customizable package that arranges travel within Norway, particularly Fjord Norway on the West Coast. Trips can start from either Bergen or Oslo, they can stretch anywhere from 1 day to several with possibilities of extensions and generally include trains, boats & buses as a means to explore the area. Now you probably know that I'm not much of a 'tour' person but this was really convenient and I appreciated the flexibility with the travel planning. With the extra long weekend, we decided to drive to Bergen from Stavanger. The trip itself is just over 200 kilometres but because of the jagged Western coastline of Norway littered with mountains and fjords, the trip takes just under 5 hours and includes two ferries. After staying the night in Bergen, we caught the first train of the Nutshell tour early the next morning. Having the entire weekend, we had arranged to stay one night in Flåm, a tiny village at the end of a fjord, before rounding out the trip back to Bergen with the fjord cruise, bus & train. The entire trip was really great. Booking everything was really easy and as I said, customizable to your liking. The timing lined up really well, the prices reasonable (for Norway anyways) and it was a great, stress-free way to see the area. Being that we were travelling in the low season, it was relatively quiet and we weren't bombarded with tourists. On the less positive side, it was a little chilly in April, particularly on the fjord cruise, the scenery was beautiful but I imagine it to be more stunning in the summer and it's still a tour made for and full of tourists. I'm excited to be able to do it again this summer when my parents visit and Norway is green and alive but I'd also love to try it in the Fall with the abundance of colours. -While the trip can certainly be done in one day, I think it would have been too rushed. Stay a night in Flåm if you can. -Pick your tickets up the day before - we left it until the morning and were greeted with a long, slow line and a bit of a scramble to make our train. -We brought along a bag of snacks which was really handy to have on the train and in the hotel with us especially being that everything (including grocery stores) were closed on the long weekend. This looks and sounds wonderful... it has been added to my list of places to visit! Wow, the coast looks a lot like Eastern Canada! I'll be sure to look into the Norway in a Nutshell tour whenever the honey & I decide to visit. LOVE your photos. We wanted to visit Norway and take a fjord cruise but ran out of time. have you checked out my friend's new yogurt shop!? not that it's somewhere to take a tourist in town for just a bit... but I've been meaning to ask! it looks like out of the polar express haha.... and really cold!! but so beautiful!! These pictures are incredible! Glad you had such a great time. Just discovered and followed your blog, looking forward to reading more! Thank you Sarah! Glad to have you here! Nice post. Great guide to weekend in norway. visit gujarat tourist places providing information about various places of Gujarat.